What is Dialysis at Sea Cruises and how does it work? 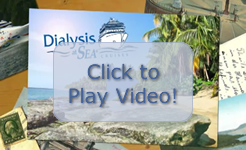 Dialysis at Sea Cruises provides dialysis services onboard select Royal Caribbean and Celebrity Cruise Lines cruises. The dialysis onboard the ship will parallel your land-based unit, as your dialysis orders will be adhered to. The dialysis takes place in the infirmary with two beds/chairs per room. Once you have chosen a specific date and destination, just call 800-544-7604 and our trained sales representatives will be able to take care of all your cruise travel needs. Why do your prices differ from those directly from the cruise line? Our prices may differ from the cruise line because we have medically contracted rates with the cruise line and incur different costs. These rates are per cabin and include the cost of our medical staff, technicians, trucks, supplies and equipment, as well as other additional costs. We must also carry extensive medical liability insurance for the cruise lines to allow us to provide this service. Are we able to just book only the dialysis through you? Since we are a medical group coming onboard, the patient and those traveling within the same cabin must book their cruise through Dialysis at Sea Cruises. Will insurance pay for my dialysis treatments? The dialysis treatment cost is a flat rate determined by the length of the cruise, and is billed separately. The dialysis patient must pay their dialysis bill prior to the cruise. Unfortunately, Medicare and Medicaid have never covered dialysis for any cruises we offer, however there are many supplemental insurance companies that will reimburse a percentage. We strongly suggest that you contact your insurance carrier for reimbursement possibilities. Once you return from your cruise, we can provide you with an itemized statement of your dialysis treatments so you can file a claim for reimbursement. We do not deal directly with insurance companies and therefore are not aware of which companies and individual policies will reimburse for the dialysis. How far in advance should I book my cruise? Availability of our dialysis appointments and cabins on the ship are limited, it is suggested booking as early as possible to ensure that a slot is available. We take up to sixteen patients a cruise and the dialysis times are on a first come first serve basis. We offer travel insurance which covers pre-existing conditions through CSA Travel Insurance. The price is based on the total cost of the cruise and the age of the travelers. Can I cancel my cruise reservation? Dialysis at Sea will assess a 20% cancelation fee on any cancelation received prior to sailing.